I’ve been thinking a lot lately about a verse in Isaiah. I’ve always found this verse inspirational. I’ve understood it to mean that the mere act of explaining your belief in God’s existence—or “witnessing”—awakens your mind and soul to the fullness of his care and concern for you, and oceans of new evidence about him on a regular basis. As you share about your faith in God with others, you will know and believe and understand him and his grand truths more deeply. You will “hear” him with new clarity. In other words, one way to know God more and better each day, is to tell others about his powerful love. While the Great Commission of Matthew 28:19 gives the clearest directive to evangelize the whole world, this verse in Isaiah might provide the clearest incentive for doing so. But in a non-evangelical context, “witnesses” brings to mind a courtroom. A courtroom is a good analogy. A witness in a courtroom is someone who testifies—who gives evidence, unfolds, clears up, and helps people reach a correct decision in cases of disputed claims, or where personal reputation is attacked. Down through history—starting with the book of Job—there have been disputed claims about God’s intentions and actions. His personal reputation has been attacked. He has been blamed for all kinds of things that may not be his doing. Perhaps this verse in Isaiah is highlighting a deeper responsibility contained in the word “witness” that I’ve missed all these years. Beyond just sharing the good news of salvation that is available through Christ, what if this verse is more specifically about defending God’s character? When God created human beings, I think Satan became very discouraged. Not only would he have to continue fighting a war against God and God’s angels, he would now also have to contend with us. As a response, I like to speculate that he formed a three-part plan. Part 1 of his plan was to tempt Adam and Eve in the Garden of Eden. “Nip this humanity thing in the bud,” he may have thought. But this didn’t cause humanity to implode into extinction, as he may have hoped. Part 2 of his plan: Get humanity to blame God for evil. How did he do that exactly? Obviously, we have no way of knowing. But I’ve come up with a dialogue in the spirit of The Screwtape Letters by C.S. Lewis that represents a potential answer. Satan: “Yes, yes! That would be a great advantage. Let’s do that in some cultures. Then again, I don’t want to be identified as the bad god. If they think I’m real, then they’ll resist me. We need to be completely invisible! Or at the very least, marginalized to the point that they believe we are responsible for very little. Plus, the gods of Dualism are fairly easy to understand. Remember, we want them to be totally confused by God. Satan: “You see minions, if we let them believe he is all knowing and all-powerful, if we can make this one hideous concession, then we can get them to believe that everything that happens—no matter how evil—is part of God’s divine, mysterious plan. God’s throne is what Satan is really after. Remember he wanted to ascend “above the stars of God . . . above the heights of the clouds,” and be equal “with the Most High” (Isaiah 14:12–14). I think he wants to be enshrined as “god” inside the hearts and minds of every being in the universe. Then he’ll have ultimate control, out from under God’s heel and able to do anything he wants to the inhabitants of the universe for the rest of time. Isn’t that the goal of all megalomaniac tyrants? Dethroning God was and is his real objective; evil is the means to get there. If Satan were able to succeed at putting God on trial, I think he would build his case on three key premises. Scripture and church history prove that God is unfit to be Lord of the universe. Any sane person upon reading the Old Testament must be horrified by the untold numbers of men, women, children, and animals killed by “Acts of God.” Think of Noah’s flood or Sodom and Gomorrah, or how God dealt with Egypt (e.g., the nine plagues, killing the firstborn sons, hardening Pharaoh’s heart, drowning the Egyptian army in the Red Sea). Or think of God’s divine endorsement of the genocidal conquest of Canaan (Deuteronomy 20:16-17), or when God ordered King Saul to butcher thousands of children and babies in the genocide of the Amalekites. (1 Samuel 15:3). Or think of Job’s undeserved suffering – losing his health, his wealth, his children, and even his will to live because of an apparent wager between God and Satan. The New Testament contains far less carnage, but there are a few examples he might bring up. King Herod was eaten alive by worms (Acts 12:23); Ananias and Saphirra dropped dead because of a lie (Acts 5:5, 10); and the book of Revelation is—on the surface—full of war, genocide, and destruction; it may be the most violent book in the entire Bible. Then, there are the countless numbers of Christ’s loyal followers who—because of their loyalty—were tortured, beheaded, skinned alive, burned to death, ripped in two, or crucified upside down. If God is truly loving and powerful, wouldn’t these be the people he would protect? I could go on. Satan surely will. There is just too much evidence in the Bible and all through Church history that seems to contradict the character of a God of love, forgiveness, and power. In a courtroom scenario I think Satan will find it fairly straightforward to use this evidence to convince the jury of God’s capriciousness, his arbitrary nature, his over-reactive vindictiveness, “…which all serve to make him unfit to be the God of the galaxies,” he’ll say. I’m sure that as Satan describes this apparent dark streak in God’s character, he will secretly revel in the trick he’s played on all monotheists, and the misunderstandings about God he has caused to fester in the Church for centuries. God’s own creation proves that he is unfit to be Lord of the Universe. Then he’ll bring up his star witness – a microbiologist. He’ll make the microbiologist describe in excruciating detail things like the parasitic worms which blind millions of people (Onchocerciasis), the virus that cause convulsions, bleeding, and hemorrhagic fever (dengue), and the bacteria that paralyzes a victim’s breathing muscles causing a slow and painful death (botulism). As before I’m sure he’ll secretly revel in the destructive power at both ends of the Plank Scale— the worldwide catastrophes and the microscopic killing machines—knowing full well that he had much more to do with them than anyone in the courtroom realizes. But he still won’t be finished in his case against God. He’ll not only bring scripture, Church history, and science to bear, he’ll also present the fact that many of God’s own faithful followers believe that he is the one who is behind suffering and evil. He’ll quote hymn after hymn, sermon after sermon, and book after book that attempt to justify the idea that harm, suffering, and calamity are usually a mysterious work of God. That there is a good, specific, divine reason behind each and every event that comes to pass - both good and evil. As before, as he describes these things he’ll secretly revel in the elegance and effectiveness of his appalling lie. “Ladies and gentlemen of the jury,” he’ll say, “these assumptions are not only prevalent in Christendom, but they have permeated almost every monotheistic civilization that has ever existed.” He will state that if so many human beings believe this about him, and believe it so widely and with such ardent devotion, it must be true. “It must!” He’ll shout as he slams his fist on the table. He’ll go on and on. Blustering. Boasting. Accusing. Hating. When Satan’s indignant tirade is finally through, that’s when God’s defense attorney will call the bride of Christ to the witness stand. Our collective role in this courtroom drama is to be God’s character witness. Which brings us back full circle to the beginning of this essay. Remember, “You are my witnesses,” says the Lord …” (Isaiah 43:10) With God being the defendant, he may not have the chance to defend himself. He might be silent before these accusations the way that Jesus was silent before Pontius Pilate. (Matthew 27:12-14). As witnesses, we’ve got to oppose all of Satan’s accusations. Our job is to undermine and subvert Satan’s case by giving evidence, clearing up misunderstandings, and helping the jury reach a correct decision about God’s character. We have to present testimony about his glory, his goodness, his powerful, self-sacrificial, restorative, sustaining love, and his flawless nature of light, Spirit, truth and grace. In response, Satan might say, “You can use all the adjectives you want, but the bottom line is he might be wonderful to you, but he wasn’t very wonderful to the millions upon millions of suffering souls who starved to death during the Great Chinese Famine, or were tortured to death in the global slave trade, or died at the hands of the Crusaders or the Inquisitors. If we explain away evil with the “God is mysterious” platitude, that will play right into his hands. It will prove his point that God has duped us, convinced his adherents to believe in his goodness and power despite all evidence to the contrary. It will be yet one more piece of evidence as to why God is unfit to control our universe. And that’s when the real work begins. That’s when we as God’s witnesses have to explain how to reconcile the character of Jesus with all of the violent portraits of God in the Old Testament. It is beyond my intended scope for this essay to explore how to reconcile these two conceptions of God. It might take 1,500 pages to address such an issue. Thankfully, someone has already done so. 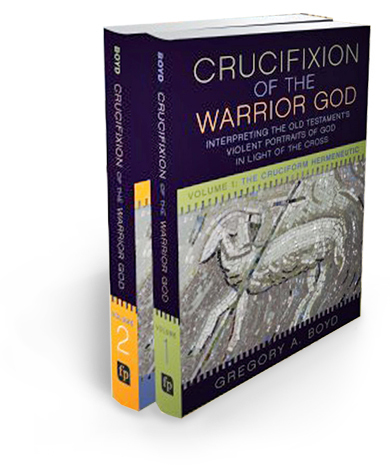 In Greg Boyd’s brand new two-volume book, Crucifixion of the Warrior God, he makes the case as thoroughly as anyone ever has that “God is like Jesus; God has always been like Jesus and there has never been a time when God was not like Jesus.”  Boyd conclusively explains how the portions of scripture that depict God commanding or committing horrific acts of violence and destruction actually point to the self-sacrificial picture of Jesus dying on the cross for his enemies. This second trial, a trial for all eternity will finally and fully expose Satan as a liar, a destroyer, a murderer, and the original source of all suffering and evil. We need to be ready for that day. But really, it’s not a day in the distant future. It is now. It is already here. We must defend God’s character every day with our actions and our words. We must express and demonstrate that Jesus is the exact representation of God’s character and the radiance of his glory (Hebrews 1:3). And we must put Satan on trial. As we do the job of a witness, not only will we be helping to sway the jury about God’s character in the heavenly courtroom, but our souls will be awakened to the fullness of God’s care and concern for us, and oceans of new evidence about him on a regular basis, just as the verse in Isaiah foretold. Though Sigve Tonstad’s marvelous Saving God’s Reputation thoroughly refutes this understanding of Revelation. Putting Satan on trail is a bit abstract. So, to explain, I think this will require the global body of Christ to, in the words of Ralph D. Winter, “recognize and ponder more seriously the kind and degree of harm Satan is able to cause. We need to unmask the works of Satan.” This will involve the combined and cross-disciplinary efforts of theologians, scientists and many others and will hopefully result in a complete termination of our automatic tendency to overlook Satan’s active involvement in our world. In other words, if Satan has been at work corrupting God’s creation and covering his tracks, then we must be at work unmasking his deeds and attacking them at their roots. Posted on August 20, 2017 by Brian Lowther and filed under essays and tagged warfare worldview witness satan Crucifixion of the Warrior God Monotheism. Tentative observations and thoughts which we may do well to take into account at least hypothetically in the attempt to form an overall understanding of the story of life on this planet and the stridently apparent contradictions to that development, thus finding an answer to the common perspective that God, not Satan, is the author of disease and suffering. Posted on March 23, 2017 by Ralph D. Winter and filed under essays and tagged Ralph Winter. Disease eradication, because it takes the globe as its clinic, faces monster-sized complexities. It is a cause that requires a kind of zeal that is reminiscent of the dedication that has propelled missionaries around the globe for centuries. The trouble is that we as the body of Christ have never considered a coordinated disease eradication effort within the range of our responsibility. Should we? Posted on June 22, 2016 by Brian Lowther. Posted on January 30, 2015 by Beth Snodderly and filed under essays and tagged genesis tohu wabohu god's will shalom greg boyd chaos beth snodderly. Mark Twain famously said “to trust the God of the Bible is to trust an irascible, vindictive, fierce and ever fickle and changeful master." Even Christians struggle with an Old Testament God who commands genocides and describes himself as both vengeful and jealous. But Brad Cole attests that "The message of the Bible . . . points to the character of God as being all-good, all-loving, and even incorporating supreme humility, service and kindness." Posted on November 9, 2009 by Brad Cole and tagged God's Character Mark Twain Richard Dawkins theodicy worldview. Posted on July 30, 2006 by Beth Snodderly and filed under essays. Why it is that the mounting muscle of the very considerable movement of all those globally who are moved by Jesus Christ has not weighed in either theologically or practically in the area of working to correct distortions of nature and of God’s will by going to the roots of the problem of disease? Posted on November 7, 2004 by Ralph D. Winter and filed under essays. What would Jesus have said to his hearers if they had known what we know about germs?” Would He have warned them against perversions of their DNA by Satan? Would He have encouraged them to fight back and not to assume that destructive forms of life were made that way in the original creation by God? Posted on May 7, 2004 by Ralph D. Winter and filed under essays and tagged evolution genetic engineering satan intelligent evil cambrian explosion Genesis 1:1 asteroidal impacts calvin luther copernicus. The minimal progress missions have made against the practice of female genital mutilation— many do not even address the subject for fear of losing converts—is mute testimony to the awesome power of what we could call “Group Self Deception,” a type of culturally reinforced delusion. Posted on February 7, 2003 by Ralph D. Winter and filed under essays and tagged Ralph Winter contextualization syncretism Pentecostal Charismatic couvad female genital mutilation reverse contextualization Scientific American heart disease Harvard Medical School Jimmy Carter Christianity Today UCLA Evangelicals Fuller NEWSWEEK Upton Sinclair. The thing that strikes me is the assumption that God, not Satan is the source of disease. Evangelical leaders are not constantly promoting the destruction of Satan’s works in general, much less in the area of disease. The Bible would urge us not to blame God for Satan’s endeavors. Is not God asking us to fight disease in the Name of Christ? Posted on December 31, 2002 by Ralph D. Winter and filed under essays and tagged theodicy cancer FDA Atlantic Scientific American Atherosclerosis origins of disease Neo-Platonism Jonathan Edwards Philip Yancey James Dobson When God Doesn't Make Sense. A handful of (mainly secular) people studying the Book of Creation have [essentially] discerned therein that God is not the author of the twisting and distortions of that Creation, but that there is a whole array of intelligent pathogens to be fought and exterminated. Posted on December 8, 2002 by Ralph D. Winter and filed under essays and tagged Ralph Winter U.S. Center for World Mission bone marrow cancer nature of God glory of God R.C. Sproul microbiology Intelligent Design heart disease Evangelicals native Americans eradication TIME NEWSWEEK. There is absolutely no evidence I know of in all the world of any theologically driven interest in combating disease at its origins. I have not found any work of theology, any chapter, any paragraph, nor to my knowledge any sermon urging us to go to battle against eradicable disease pathogens. Posted on December 16, 2001 by Ralph D. Winter and filed under essays. If we think of the remaining unreached peoples as enemy occupied territories, rather than merely unenlightened areas, “reaching” them with “a viable, evangelizing, indigenous church movement” could seem to assume the possibility that the problem of unreached peoples is merely the absence of good news. Posted on June 18, 2001 by Ralph D. Winter and filed under essays. Posted on April 10, 2000 by Ralph D. Winter and tagged worldview evil faith satan theodicy James Dobson Philip Johnson evolution Michael Behe. See how we're trying to drive new thinking. Browse through the events we've sponsored. Explore the new initiatives we've fostered.